Following our successful Speed with Guy Martin challenge last year (where we smashed the gravity sled record at a whopping 134.368 kph / 83.49 mph) North One TV decided to get in touch again and see if we would help to set the gravity racer record with Guy Martin (http://www.guymartinracing.co.uk/about-guy/racing/) at the helm? Hmm let me think about that for a moment….yes we would! push. There may be no mechanical aids to this push. Any length of run up is allowed. Any design is allowed so long as it is complying with the above definition. The soapbox must be controlled by a driver. person making the attempt to choose the location most suitable. The speed must be calculated by timing the soapbox over a distance of 100 m.
There is no official gravity racer world record, however to set a record we knew we had to beat the unofficial one set by the Bodrodz Atomic Splinter Gravity Car Speed Run in September 2012 at 84.4 mph on the Burkhalter Gap road in Georgia, USA. Arguably this was a much more difficult challenge than the sled with numerous areas to consider such as; the chassis, brakes, steering, suspension, aerodynamic body, safety, the location and of course generating the fastest speed possible! Each one could be a separate project in themselves but we had 4 months to come up with a design, build it, test it and then attempt to set a world record. Watch this Sunday 8pm on Channel 4 to see how we get on! 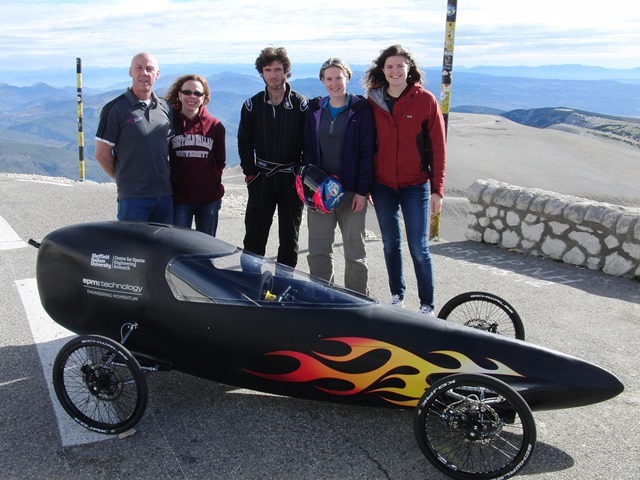 Making things happen in #sports engineering/science & #health @sheffhallamuni. Engineer & business professional, love fitness, mindmaps & ride a big motorbike. Patent application in progress, international conference presenter, published paper and working on the Channel 4 TV programme 'Speed with Guy Martin' - it's been an interesting year! An award winning graduate in Mechanical Engineering I developed change management skills in the defence manufacturing sector and then went on to build and test Challenger 2 main battle tanks. Selling my sports car to pay for a full time Masters in Business Administration, I developed my career into an international management and ventures consultancy. Here, innovation support was delivered to businesses in London and Lincolnshire as well as with the Carbon Trust incubator supporting renewable energy businesses to access venture finance. As Business Development Manager at Sheffield Hallam University my focus is Sports Engineering, Exercise Science and Health Technologies. My diverse experience enables me to add value to projects and tendering opportunities. Ideas have been put forward in the academic environment that has resulted in product concepts, strategy focus and new business from small consultancy projects through to multimillion pound programmes. Congratulations on your record. Looking forward to reading your follow up articles over the coming week. Will you be repairing the racer and entering it into any races next year? You guys claim to be Engineers? In response to Andy’s suspension question..
After watching the film and noticing the lack of suspension movement, I was curious about this too so I did a little digging (I wasn’t aware of this page at the time..) The components appear to be from a kit developed/sold by Gravity Racing Ltd. and are simply an elaborate wheel alignment & corner weight adjustment device. Without wishing to sound overly critical, I can’t see how this design would work satisfactorily on anything but an absolutely flat surface. At high speed, any undulation in the road surface could cause sudden changes in the forces being applied to the tyres resulting (during cornering at least) in momentary unpredictable loss of grip. This lurching would be difficult to counter, even for an experienced pilot, and was (possibly!) the cause of Guy’s tank slapper and resulting off. Substituting the turnbuckles for spring/damper units would not have necessarily improved the handling though. If the front is, as it appears in the images, a parallel equal length set up, the ground level roll centre would promote high roll angles and equally high positive camber change during cornering (reducing max cornering speed). It’s harder to judge the rear end set up from the images. http://www.formulagravity.co.uk/new_build.html If the upper link and hub carrier form a single strut then it could perhaps be made to work but if the upper rod is an upper link then it would be considerably worse than the front end. A four link design with this geometry would have its roll centre way below ground and would be highly unstable in pretty much all conditions. On a positive note, I feel the overall effort was outstanding and entertaining and ultimately good TV which was, presumably, the primary goal. The racer itself has proven to be tough and has plenty of development potential. Given some suitable wheels/tyres and suspension, I have no doubt it could take the record past the 100mph mark. It would be very interesting to see it run down the Burkhalter Gap Rd, GA (to me anyway..)! For those that are not familiar, the road descends about 350m in 3 or 4 km in an almost totally straight line.. Yum! The programme was brilliant; thoroughly entertaining and quite informative. I thought it interesting that you chose to ballast the vehicle rather than improve the aerodynamics though. The spoked wheels were a clear way to lower drag and could have been achieved with gaffer tape and card if you had nothing else on the day. This makes a significant difference on bicycles with half the number of wheels travelling at a third of the speed. On the subject of wheels, there was no mention of how rotational inertia affected the results of the three wheels. I assume there’s a reasonable difference in mass between the wheel sizes as the cross-section of the rims at the circumference is likely to be similar and the circumference of the 20″ wheel is about 3/4 of that of the 26″ wheel. I assume the spokes need more strength to cope with the larger moment around the axle in cornering. Could you provide some detail on the suspension? The front appears to be a double-wishbone/pushrod arrangement, but the rear seems to have a lower wishbone with inboard rod-ends and a top tie rod with inboard and outboard rod ends. How is ride governed? Is the lower wishbone actually a rocker with inboard spring/dampers? Is there a reason this approach wasn’t taken for the front too? Was the location influenced by the altitude and lower drag associated? I seem to have replied in the wrong place.. I don’t work here but have commented about the suspension if you’re interested..
Haha.. I’m making a right hash up of this! The reply is above your post..
Congratulations! I enjoyed watching the film last Sunday. How do I access the Science and Technology articles? @Andy I think the main reason for going for 20″ wheels is the ready availability of slick tyres rated to 100+psi, which easily outweighs the theoretically increased rolling resistance of the smaller diameter. Moment of intertia affects acceleration, but doesn’t directly affect top speed because at terminal velocity you are not acceleration. Lighter wheels will get you to your top speed quicker, but that top speed will be the same regardless. Of course there are other issues around the wheels, and smaller wheels have less aerodynamic drag. Putting lighter wheels on will not help you if you don’t then replace the rotating mass you saved with static ballast somewhere in the cartie. Our two further blogs have been published with more information – enjoy! Hello, i think that i saw you visityed my web site so i came to “return tthe favor”.I’m tryig to find things to improve my site!I suppose its ook to use some of your ideas!! Article writing is also a fun, if you be acquainted with after that you can write otherwise it iss complex to write. ← The UCI hour rule change, a record resurgent?